Once you start out playing saxophone, you’ll probably start by learning how to play alto sax. However, there are other types of saxophones out there that offer a different sax-playing experience and are worth trying out. One of the most prominent out there is the tenor saxophone, and if you don’t know a lot about it, you’re right where you need to be. In this article, you’ll find out some info on what the tenor sax is as well as how to get the best tenor saxophone available. What is the Tenor Saxophone? The tenor saxophone is one of the ORIGINAL 14 models invented by Adolf Sax in 1840 and patented in 1846. 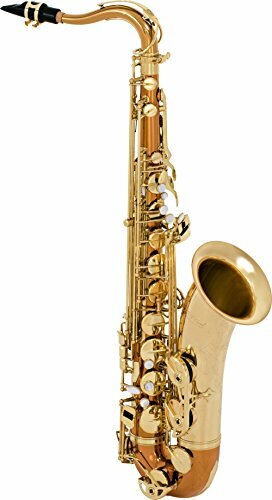 It is one of the most popular models out of the series, along with the alto, soprano and the baritone saxophones. It is also the second largest, right after the baritone sax. Tenor saxophones are tuned in the B♭ key, and the sound is brighter when compared to the other types due to a lower pitch. It can easily blend with the sound of alto, soprano and baritone saxophones and it almost never sounds out of place. This is the reason it’s often used in ensembles and many different music genres. Visually, it is distinguished from other types not only by its size but also by the shape of its neck. There’s a small bend near the mouthpiece, something that the alto and baritone saxophones don’t have. It is the best second choice for beginners once they get a handle on how to play the alto sax. For taller people, it’s usually the first choice when they begin starting to learn how to play the sax since it’s easier to hold and blow into due to its size. If you find the alto sax to be too small for you, pick up a tenor. Overall, the tenor saxophone is one of the most popular sax types out there, and every saxophonist should eventually learn how to play it. If this is your first time buying a tenor saxophone, you might not know what to look for. You might find that it is not unlike buying an alto sax, but there are some KEY DIFFERENCES between the two that you need to consider when purchasing. Here, you’ll get all the info you need to get the best tenor sax for you. Not all saxophones are made for players of the same skill level. Even if you’re an intermediate player, you might have no idea what to do if you get a professional-level saxophone in your hands. You need to know what your skill level is and choose accordingly. Beginner or student saxophones are made to be as forgiving as possible. They’re cheap and easy to use, the keys are accessible and easy to hit, and they’re made with an emphasis on accuracy. They’ll sound decent even if you’re not that good. However, they are easy to break and unsuitable for more refined and advanced techniques. Intermediate saxophones are there for you once you outgrow everything that the beginner sax can offer you. They are smoother, more responsive and produce sound more similar to a professional sax. They are good for beginners looking to take the next step or professionals that are picking up a type of sax they never played before. Professional saxophones are the real deal. They are made to look good, sound great and provide a wide range of advanced options. You need to shell out a lot of money for them, but you get the best of the best. If you’re a pro or looking to become one, this is what you need to get to make the most out of your sax-playing skills. What Brand Should You Get? There are many saxophone brands out there right now, too many to count. Some do stand out over others as better but, for the most part, the choice of brand comes down to your taste and needs. Yamaha is among the most popular brands out there today. They used to have quite shoddy workmanship, but they have improved since. Today, they offer consistently good and sturdy saxophones that won’t fail you, but won’t stand out either. Selmer is another well-respected brand, but they have fallen from grace in recent years. They’re still a good brand, but their products seem overpriced in today’s market. Windsor is a long-standing brand that makes some of the best saxophones around. However, their products are also incredibly expensive – justifiably so. If you’re a pro looking for the best of the best and have money to spare, Windsor is the ideal choice. Kaizer is a highly affordable brand that makes great saxophones. They’re probably one of the best brands for beginners or pros who are on a tight budget and players looking to go pro. Martin is an older brand that still makes good saxophones, but they have fallen by the wayside a bit. They’re still worth checking out. 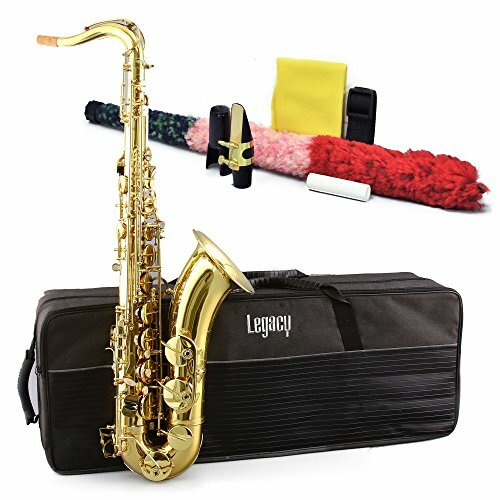 Cecilo saxophones are on the cheaper side, so they are a good choice for beginners and for a disposable sax, but most of their products are not great. Cannonball is an overlooked company making saxophones that are exceptionally easy to tune and come at a great price. Those are just a few, but you get the gist of it. Choose what you think fits you the best. Does it Have the Right Construction for You? Choosing a saxophone that’s solidly built and fits your playing style is a MUST. Here are a few things you need to look out for in different parts of the sax. Most modern saxes are ribbed, but non-ribbed ones still exist and if your hands are aching with a typical sax, look for one that’s not ribbed. Beginner models are usually not ribbed, and non-ribbed models are less durable, so watch out. Do you need additional keys, or can you play some notes even without them? If you’re skilled enough, extra keys will just be extra clutter instead of being helpful. However, if you do need the help, a high F# key or a high G key might be invaluable. Watch out for saxes with alternate key positions as well. The shape of the neck can be instrumental in playing. If you can’t seem to be able to comfortably play your sax a longer or a shorter neck could fix the issue. Luckily, necks can be replaced in case you buy a sax with a neck that doesn’t fit you. Is it Made Out of the Right Materials? Saxophones are primarily made out of brass, a proven, staple material. However, some parts aren’t made out of brass, and there are saxes that use ZERO brass. Bronze, copper or sterling and nickel silver in the construction, especially around the bell, darken the tone of the sax. They also make it more expensive and more difficult to maintain though. They can also make the instrument much heavier, so make sure you’re comfortable with that. This is a great-looking sax for a great price, and it also performs well – however, it does have a few shortcomings. While it looks and feels good, it is less sturdy than the average sax. It does come with a 1-year warranty, but you might want to consider something else if you want a foolproof product. As far as playing goes, it performs exceptionally well, and it does have a few nice additions, like the high F# key for example. It makes things easier for beginners and pros alike. Getting started will be a bit difficult though since it’s hard to tune and doesn’t come with instructions on how to do it. Experienced players will know how to do it. This saxophone also comes with a bundle of great extras. It includes a great case for your sax, mouthpiece, neck strap, a box of ten 2.5-size wooden reeds, a cleaning cloth and rod as well as a pair of playing gloves. In addition to all that, you also get a string tuner with a metronome. Overall, it’s a good deal for the entire package, even though the sax is less durable than most. 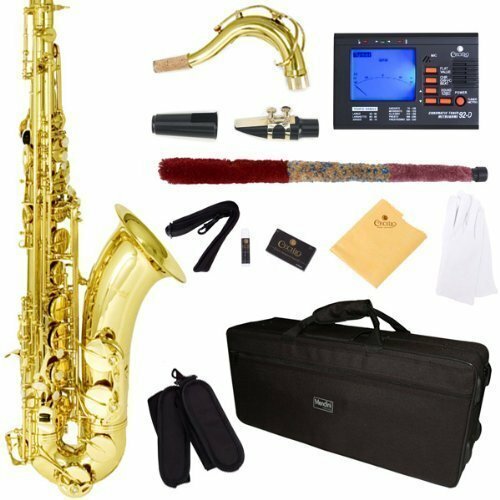 If you’re looking for a good beginner to intermediate saxophone for a good price with a lot of extras, this is the product for you. It sounds great and has a high F# key. It also has adjustable key height, allowing it to be played by kids and adults alike. In the package, you get a lot of stuff, including gloves, black case, grease, screwdriver, cleaning rod, ten starter reeds and more. Despite being made of cheaper materials, this saxophone looks impressive and akin to a professional one. Sadly, its sturdiness doesn’t equal its beauty. It’s easy to break, and it often gets damaged during shipping. Overall, it’s a good beginner sax and comes with everything you need, but don’t expect it to last for too long. Here we have an instrument that’s great for beginners and intermediate players alike. It is easy to use but highly functional at the same time. The sound is great and clear even if you’re just starting out. The construction is more than solid, with power forged keys and a sturdy bell brace. It’s a highly durable product – the only weak point is the neck, which might bend or dent if you’re not careful. It comes with a pack of reeds, a wonderful black case, cork grease, a pair of gloves, a neck strap and a cleaning cloth. It’s everything you need to get started. If you want some non-standard keys, this saxophone doesn’t have it, but you won’t exactly need them if you’re a beginner. 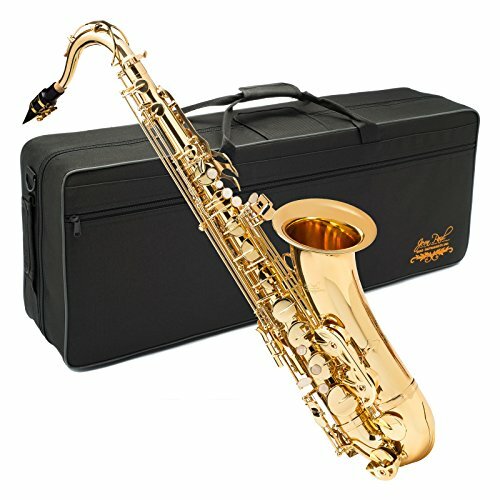 This is one of the best intermediate saxophones that you can get for less than 500 dollars. It’s not perfect, but it is more than worth considering. For starters, it plays incredibly well, and it’s easy to play, featuring pro pads, a high F# key, and a front F key. 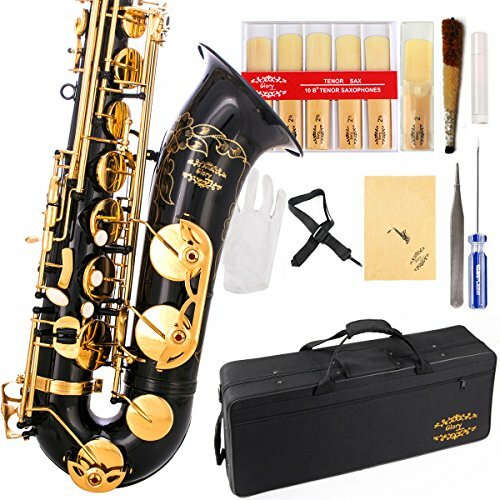 This is what makes it good for beginners as well, and you can easily start learning with this saxophone. It is good for more experienced players as well, and it will last for a long time due to sturdy construction. Even if it gets damaged, it has a good warranty. It comes with tons of extras, including a case, a neck strap, ligature and a cleaning kit. Sadly, the extras are of poor quality, especially the case. The only other major downside is the octave key. It does malfunction at times and might break, which is a serious issue. Luckily, it doesn’t happen too often but test it while the warranty lasts. This is a vintage-style saxophone made out of high-quality brass and constructed to be as sturdy as possible. All the parts are well-made and put together with obvious care. It shows in the sound as well – deep, clear and strong with no air leaks. It’s good on the eyes as well. It also comes with plenty of great extras, the best of which is the soft but sturdy case that’s easy to carry around. It does have a few problems, though. The included mouthpiece doesn’t work for band play, and the keypads can fall off. It’s nothing major, but it’s still worth mentioning. Overall, it’s just a great sax! All of the saxes here are great, which is why they’re included in the article, to begin with. Which one is best for you comes down to personal preference. But, you’re here to know which one is best and by most metrics that would be the Selmer STS280 La Voix II. It’s a great sax and can be used by almost anyone while having no major downsides. Yes, it is more expensive than most, but the quality is more than worth the price. If you’re looking for the best, that’s what you need to get. Until next time, feel free to sound off in the comments and keep the music alive.